For almost 25 years (1954-1978) the founder of this museum, Axel Niemi, entertained people with his music, stories, and knowledge about rocks and minerals. In 1990, Ronald Marshall purchased the museum from Axel. They had been close friends since Axel taught Ron how to play cribbage in 1970. Ron made major repairs to the museum building over the next few years. I met Ron in 1991 and told him how important the museum and Axel were to me. In exchange for a couple of Axel’s agates, I wrote a poem for the museum titled Perspective. After reading the poem and without saying anything to me, Ron decided that if he ever were to sell the museum — he would sell it to me. Finally, in 1997 while agate hunting together, Ron stunned me into silence and offered to sell me the museum. After the purchase was completed in August 1998, the building was completely refurbished. The history items, saved by the Niemi family for over 90 years, were sorted and displayed for the first time. My mineral collection was combined with Axel’s. After being closed for 21 years, the museum was reopened on July 4, 1999. We now take the next step to carry on Axel’s legacy via the Internet – welcome to the Gitche Gumee Museum web page! To develop educational programs that will facilitate learning and perspective building. To preserve the collection of artifacts and present the history of Grand Marais in a way that helps people to respect how hard people used to live and work a century ago. To carry on the mission started by Axel Niemi to positively influence people — especially young people. To emphasize the self-reliance of the Niemi family members so they may serve as positive role models. To preserve and expand the museum collection. * At the end of May the museum opens the Sunday of Memorial Day weekend. Note: The museum is open seven days a week from the Sunday of Memorial Day weekend until the end of September, but on Tuesdays and Wednesdays the museum will only be open in the evenings from 6pm to 8pm. I will plan on having the museum ready for appointments by mid-May each year, so if you would like to set up an appointment please email me at karen@agatelady.com, or call me at 906-494- 2590. It is best to set up appointments in advance in case I am busy or out of town. I try to accommodate impromptu appointments, but this is not always possible. For private appointments, I ask for a donation or purchase that is commensurate with the time required for the museum visit. The museum will not be available for appointments between the middle of October and the middle of May. The museum is located in Grand Marais, Michigan on the south shore of Lake Superior, about half way between Marquette and Sault Saint Marie. Once in town, go north on Main Street (M 77), past the only gas station (Bayshore Market), and turn left (west) at the next street (Brazel Street). The museum is on the south side of the second block. Look for the green and yellow building and the fish tug! Learn what life was like in Grand Marais over a century ago. Various displays and interpretive signs will help you probe the questions listed below. Each year significant changes will be made to the historical displays. What was Grand Marais like a century ago? How hard was it to make a living as a lumberjack in the woods during fierce Upper Peninsula winters? How challenging was it for commercial fishermen to battle the power of Lake Superior in hand-made fish tugs? What was it like to work in the copper and iron mines? How different were the tools, clothing, and cost of goods in 1899 compared to today? NEW DISPLAY—artifacts from the Sportsmens Restaurant with explanations of their uses. A unique gift shop is open any time the museum is operating, or by appointment. 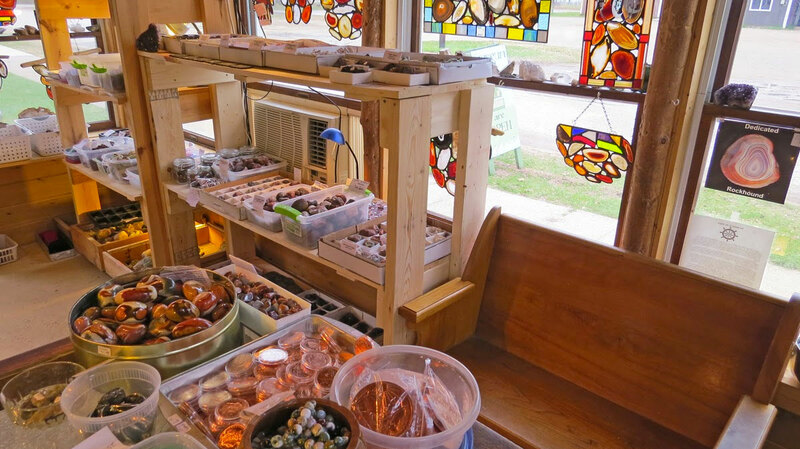 The gift shop has Lake Superior agates, other minerals, handcrafted agate products, and other unusual items. Some of these items can be purchased from the On-line Gift Shop. For previous visitors who have not been to the museum in recent years, an addition was added onto the north porch in 2006 to significantly expand the floor space of the gift shop. All sales from the gift shop support the museum’s operation. One of the services that the museum offers is a rockhounding/agate class. The class involves three segments. We start at the museum where we review sedimentary, igneous, and metamorphic rocks. We use specimens and a microscope. The more you know about beach rocks, the better agate hunter you can become. Then while still at the museum we use specimens to learn about the characteristics of agates. Next, we go down to the beach where we have a friendly rock hunting competition. While on the beach, I describe agate hunting strategies and point out other collectable rocks. Finally, we return to the museum wherein everyone picks out a free agate. Next I show you incredible specimens from my “wowser box.” These are intended to entertain, inspire, and teach. Participants also receive a summary handout and a free copy of the Beach Rock Identification Guide. I have run this class hundreds of times. Usually people are very surprised and enjoy the class much more than they expected. The class takes around 3 hours. Karen Brzys wrote this poem for Ron Marshall and the Gitche Gumee Museum in November 1992. She assumed that some day Ron would open the museum. Instead, the poem convinced Ron to someday grant Karen the chance to buy the museum, which took place in 1998. To walk the path you’re on, it helps to look behind. Precious moments go and find; the clock you must unwind. demonstrate how things have changed as history’s turned the page. As you travel back, your focus will come clear. You’ll learn from those before; go forward with no fear. There are agates with their bands: a layer for each season. The strength of their endurance can help you to gain reason. While wandering through these rooms, you’ll see objects from the shore. They’re meant to stimulate your thoughts by the rolling waves that roar. are here for your enjoyment: let your heart these relics touch! how special are the people in this great northland! Before leaving — get perspective; appreciate where you are. Like the agates with their colors, you really have come far! Go forth in your adventure; seek balance to be your best. Take with you the wisdom you’ve gained while here a guest! Longfellow was fascinated by the books published by Henry Schoolcraft, a friend who served as an Indian agent in Sault Sainte Marie, MI. Longfellow wrote at least a dozen poems about an Indian boy, Hiawatha, who lived next to the “Gitche Gumee … shining big sea water” (Lake Superior). In honor of the Niemi family’s fishing business, below is a copy of the poem: Hiawatha’s Fishing. During the early 1890s, when the Alger-Smith Lumber Company extended their railroad and relocated their operation from Seney to Grand Marais, there was a massive influx of people. By 1900, Grand Marais grew to include over 2,000 permanent residents, along with thousands of other transients who worked in the logging camps and mills. The bustling town of Grand Marais featured many fine retail shops, a hospital, an opera house, 28 taverns, one of the finest schools in the Upper Peninsula, five large lumber mills, and a Coast Guard Station. One person responsible for “recruiting” immigrants from Finland to the Upper Peninsula region was Wooden Leg Matson. For a set amount of money, he arranged for immigration papers, transportation from Finland to Michigan, employment, and a track of land. Otto Niemi decided to start a new life in America and paid Matson to immigrate to Grand Marais in 1905. Soon after arriving, he met Alino. They were married in 1906 and started their family in 1907. Although these first few years went well for the Niemi family, it didn’t last long. By 1910 all the trees had been harvested and the Grand Marais lumber era came to an end. When the railroad was shut down, all but two hundred of the town’s residents left. The Niemi family, as well as my own family (the Hills), decided to stay and try to eke out a living. Otto was determined to acquire a larger house. He didn’t have enough money to buy the materials needed to construct a house, so he went in search of someone who was willing to give him their abandoned house. The house, which was four blocks away, was dismantled and rebuilt on his lot. To save money, he straightened and reused all of the nails. The house still stands today, located directly west of the museum! The house to the west of the museum was the Niemi family’s homestead. NOTE: The house has now been remodeled. Only the original frame remains. The inner and outer walls, roof, foundation, and infrastructure have all been replaced. Otto Niemi emigrated from Finland in 1905 to work in the Grand Marais lumber mills. He married and started a family only to suffer with many others when the mills closed in 1910. Being resourceful, self-sufficient Finlanders, the family built a series of three fish tugs and made a living off the lake for almost a half century. The museum has several displays honoring the Niemi family’s work ethic and self-reliance. The premier display is the fish tug, Shark, which is located outside the museum. The Michigan Maritime Museum, that owned the tug during the mid-1990s, verified that it is the last hand-made fish tug left intact in the entire Great Lakes region. It was quite a project to acquire, move, and refurbish the fish tug so that it could return back to Grand Marais. NOTE: After spending many thousands of dollars to acquire and to try to preserve the fish tug, we lost the battle in 2016. Attempts were made to get preservation groups to join in the cause, to no avail. To prevent someone from getting hurt (the tug’s wood was too far gone and the tug was listing to the left), we had to have the tug removed. After the railroad was shut down, Grand Marais was extremely isolated. During the warmer months, a schooner serviced Grand Marais from Sault Saint Marie. In the winter, the only way to get to town was by dogsled, sleigh, snowshoe, or ski. All of these options proved to be a long 25-mile trip from Seney. Those few brave souls who stayed in Grand Marais had no choice but to be self-sufficient. People found ways to live off the land and the lake. The Otto Niemi family was one that chose to live off the lake due to Otto’s experience in Finland working on the sailing sloop Hanna. The sloop’s crew hauled grain, cotton, and gunpowder between Finland, Scotland, and other European ports. After doing odd jobs for a few years, Otto decided to use the knowledge gained while working on the Hanna to build and operate fishing boats to support his family in Grand Marais for almost five decades. First, Otto tried to fish from the only vessel he had: a rowboat. He realized, though, that Lake Superior would not cooperate with a boat that small. So, in 1917, Otto built his first tug, the Swan. Like all three fish tugs, it was hand-built. 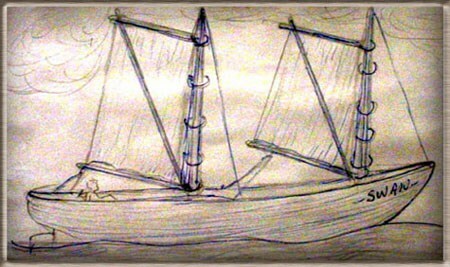 It measured 23 foot long and was a two-masted sailboat, since Otto at that time could not afford to buy an engine. When Otto first started sailing her, he had only his hands to pull up the lines of hooks and only the sails to maneuver in the tricky winds of Lake Superior. Otto always said that sailing in to and out of Grand Marais Bay was harder than sailing the ocean. Finally, after a couple of years, he was able to purchase a Sears “Make and Break” one cylinder motor that had one speed — Slow! Otto built his second tug: the Elk. 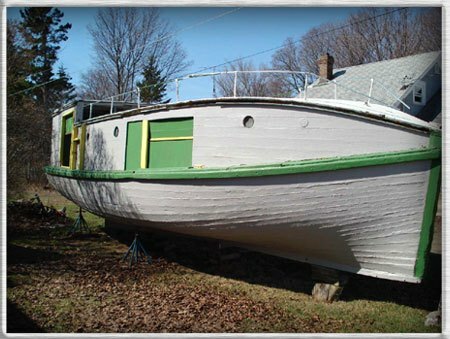 She was a 34-foot cedar strip-built plank boat. He searched the surrounding woods to find naturally bent trees from which he cut the ribs for the boat. She was initially constructed with a small pilothouse, which was later expanded, to avoid the “attack” of Lake Superior’s trailing wave. The Elk was powered with a two-cylinder, two-cycle engine as well as with the one cylinder motor out of the Swan, which was used for backup. The Elk was also outfitted with an automatic net lifter, which allowed the Niemies to put out more hook-lines or nets. This tug was used successfully for 16 years. The third fish tug built by the Niemies was the Shark. After many years of experience fishing out of Grand Marais, Otto designed the Shark specifically for Lake Superior’s rugged wave patterns. The Niemies used a pig boiler to create the steam needed to bend the ribs and planks. White oak was used to make the planking for the 34-foot long hull. This boat was a little more intricate than the Elk, so it took two winters to complete her. 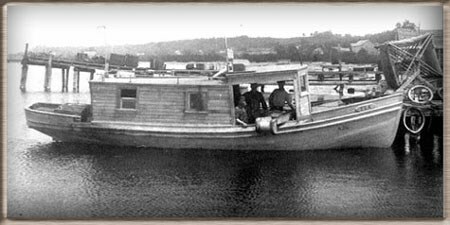 She was put into service in 1940 and was used by the Niemies until 1953 when Sea Lampreys and other factors all but desecrated the commercial fishing industry in Lake Superior. What a catch! Otto and Axel are holding 3 large Lake Trout: 28,32.5, and 48 pounders! The Shark on launch day. Axel is on the left; Otto is on the right. The Niemi family homestead is the gray house to the west of the museum. This self-reliant family built their own fishing boats, grew vegetables, raised chickens and cows, and took care of their own needs. Their fortitude and hard work manifested in everything they did. The collection in this museum, is the result of a lifetime of dedicated rockhounding and historical preservation by the youngest of the six children, Axel Niemi. While other fishermen pushed operations well into the fall of the year, the Niemies were satisfied just to make a living. When they had enough money to survive the winter, the Niemies quit fishing for the year. Information provided by Alfred Niemi who fished with his Dad for six years. Newberry, Jan 18, 1935—Six valedictorians in high school graduating classes, is the unique record of a Grand Marais, Mich. Family. The valedictorians are the four sons and two daughters of Mr. And Mrs. Otto Niemi of Grand Marais. This unusual family was brought to the attention of Michigan school authorities by the Rev. Lauri Ahlman, pastor of the Finnish Lutheran churches in this district. Eugene E. Elliott, State superintendent of public instruction has written a letter of praise and commendation to the Niemi’s for being the parents of such a fine family. The first names of all the Niemi children begin with the letter “A”, which may have something to do with their scholastic record. The boys are Arvo, Arvi, Alfred, and Axel, and the girls are Aila and Aino. Axel, the youngest was the last to graduate from Grand Marais high school with valedictory honors. He graduated in 1935. The Niemi’s are fisher folk at Grand Marais, and all of the children live at home. Mr. Ahlman pointed out another singularity. He said that ever since the start of Grand Marais high school, every valedictorian has been of Finnish descent. Axel’s brother Arvi, in front of the Shark soon after it arrived in Grand Marais. 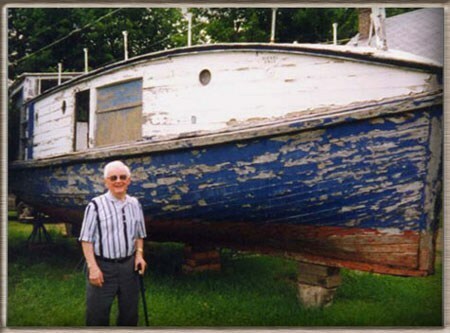 Mr. Pott explained that in 1994 an article was published in the Inland Seas Journal about the Niemies and the three fish tugs they had built. Inspired by the article, he convinced the museum’s board to acquire and renovate an old fish tug. A couple of weeks later, as he was driving outside of South Haven he spotted an old fish tug next to a corn field. He stopped and asked the farmer about the tug. The farmer replied: “I don’t know much about her, but I think she was built in the Upper Peninsula. I only bought her so I could take out the Fordson motor, put that motor in my tractor — and now my tractor works just fine!” After conducting some research, Mr. Pott discovered that this was indeed the same boat described in the recently published article. The farmer gave the tug to the museum. However, the museum never renovated her as it was decided instead to renovate a larger fish tug. When I explained to Mr. Pott about reopening the Gitche Gumee Museum, the agreed to donate her so that the Shark could come home. During the time that the Maritime Museum owned the Shark, a student from Western Michigan University studied her. It was determined that the Shark is the last hand-made fish tug left intact in the Great Lakes Region. A professional boat hauler was hired, who charged by the quarter mile for an 800 mile round trip. We turned many heads as we traveled up the highway and over the Mackinaw Bridge on the long road home to Grand Marais. NOTE: After spending many thousands of dollars to acquire and to try to preserve the fish tug, we lost the battle in 2016. Attempts were made to get preservation groups to join in the cause, to no avail. To prevent someone from getting hurt (the tug’s wood was too far gone and the tug was listing to the left), we had to have the tug removed. NOTE: If there are any names that you feel are missing from this list, please email Karen at karen @ agatelady.com.